In the realm of gluten-free cookies…these are by far the most adorable. And yes…food outside of Japan can be adorable. Trust me. When I opened up my package of Ian’s Gluten-Free/Wheat-Free Chocolate Chip Cookie Buttons, I wasn’t expecting little dime-sized cookies. But…that’s what I got. Mini-mini-mini chocolate chip crunchy cookies. No wonder an entire serving was 23 cookies. Now I understand why. Well…you know how I am about cookies. And I spotted these on a shelf at Publix while I was in Birmingham, Alabama for the Making Tracks for Celiacs event. Yes…I realize how long ago that was…but I’ve had a lot of food to cypher through since then. Trust me, it was never my intention for these to make a home in my pantry. And that’s why tonight…they became dessert. A little bit about Ian’s, first and foremost. Ian’s, as a company, set out with a mission to provide high quality, all-natural and allergy-friendly foods to the market that consumers can trust. The company takes great pride in providing quality foods they feel customers will enjoy. And they are always experimenting and coming up with fun and delicious allergy-friendly items to bring to the table. Fun…I think cookie buttons fall under that category. So, what are cookie buttons? Well, they are miniature chocolate chip cookies. Honestly. That’s all they are. These crunchy little cookie buttons are the tiniest chocolate chip cookies I have ever seen. And I’ve seen a lot of chocolate chip cookies. I’ve eaten a lot of chocolate chip cookies too…but that is beside the point. These itty-bitty Chocolate Chip Cookie Buttons are one of those snacks that just call out to be fed to children. I mean, they are bite-size and perfect for snacking. They are sweet without being overly sweet. The crunchy texture is perfect, not too hard, not too soft. And they are just one of those snacks your fingers will find and pop in your mouth. The chocolate chips give each cookie a nice hint of sweetness, and the cookie part itself is sweetened just enough without it being too much. 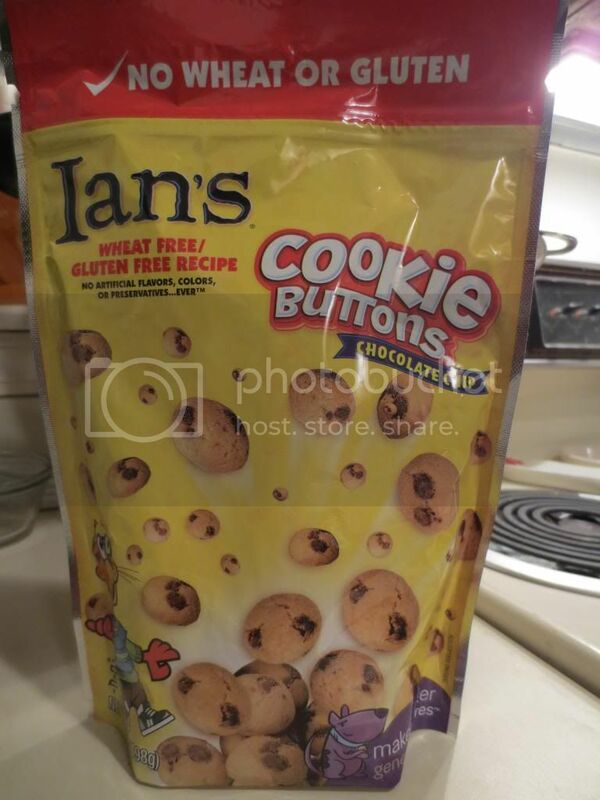 A serving of Ian’s Chocolate Chip Cookie Buttons is 23 cookies (or 30 grams). This serving will set you back only 130 calories and 4.5 grams of fat. That’s awesome for a cookie treat, yes? This serving also provides 11 grams of sugar, which isn’t bad considering…these are cookies. While these cookies do contain soy, egg, and milk, they are completely gluten-free and wheat-free. I admit…they are nowhere near being the best gluten-free cookies I have ever tasted. They don’t even slot into my top 10. But…there is something very…intriguing about these. Would I buy them again? Eh…perhaps. I’ve had one too many amazing gluten-free cookies out there to really just settle on these…but they aren’t bad. And the size of them makes them fun and easy to travel with. So, they aren’t fantastic for kids or for a quick snack if you are on the go or just in a hurry. 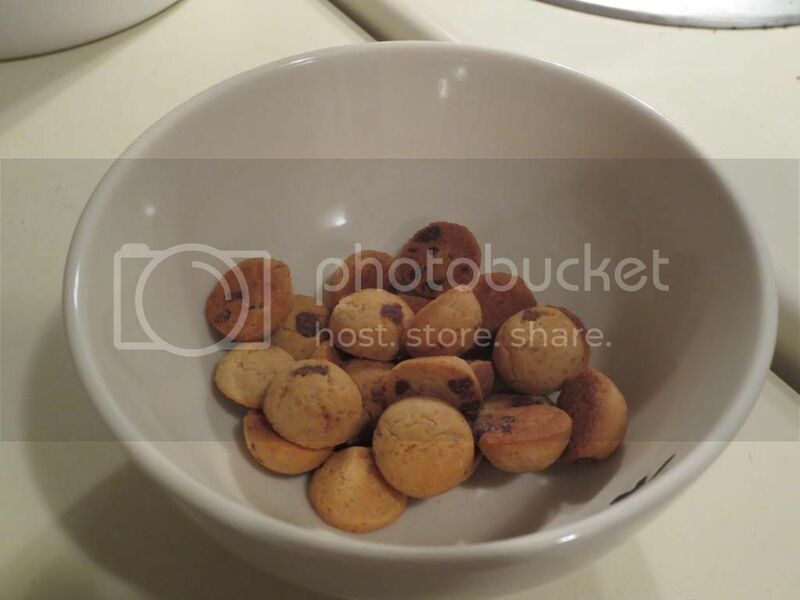 And…come on…they are mini chocolate chip cookies. Cuteness counts for something, yes? This entry was posted in Chocolate, Cookies, Food, Gluten-Free, Products, Review, Snacks, Sweet Stuff, Vegetarian by The Celiathlete. Bookmark the permalink.